Improving Ollerton Town’s climb away from the drop zone was knocked off course by a 2-0 defeat at home to bottom-of-the-table FC Bolsover. In front of a season’s best crowd of 164, the hosts were hoping to extend their five-game unbeaten run in the First Division of the Northern Counties East League. But instead, it was Bolsover who continued their resurgence. After losing all 18 of their opening league fixtures, Matt Chatfield’s side have now won three of their last seven, in which they have been beaten only once. In a game played at a tectic tempo, both sides struggled early on and the closest to a breakthrough came when Bolsover’s Daniel Palmer found space in behind the home defence but fired wide from close range. 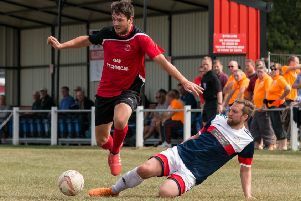 For Ollerton, captain Sam Stretton and top scorer Gav King both had chances towards the end of the first half, but Dave Winter’s men were still unable to put the visiting defence under too much strain. Bolsover started the second half brightly and finally got their reward when Liam Flint put them one up within minutes of the restart after a corner. Ollerton had little time to recvover before the visitors had struck again. This time, Cam Hough whipped in a cross from the right and Jack Warwick met the ball to convert his tenth goal of the season. The quickfire double left the home side with a mountain to climb. To their credit, they battled on and King had the ball in the back of the net, only to be adjudged offside by the officials. As the minutes ticked by, Bolsover showed their resolve to contain the Ollerton pressure and saw out a well-deserved victory to add to the growing feeling that they could yet pull off the great escape at the foot of the table. OLLERTON generously donated all the gate money from the match to St Joseph’s Academy in Boughton, which is fundraising for a defibrillator. A fantastic total of £870 was raised, taking the school closer to its £1,200 target.